Dennis Cox is an award-winning travel and location photographer for magazines, books, corporate publications, and advertising. 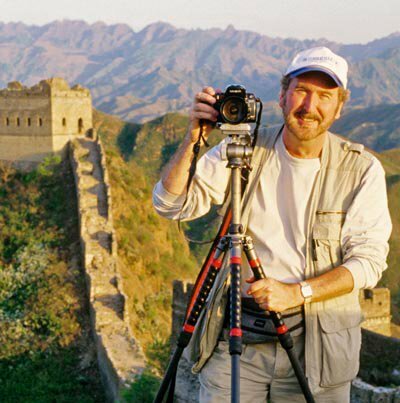 He has photographed on all seven continents and has specialized in photographing China since 1976. His photographs have appeared in an eclectic range of publications in numerous countries worldwide. He has been a regular contributor to such magazines as Midwest Living, Forbes, Information Week, and U.S. News & World Report, and to the publications of companies including Northern Telecom, Unisys, and Fed Ex. His stock photos have appeared in hundreds of publications worldwide including GEO, LIFE, Travel Holiday, Travel & Leisure, Islands, National Geographic Traveler, Esquire, Endless Vacation, Atlantic Monthly, Winds, Silk Road, and Hemispheres. In addition, Dennis has photographed thirteen books: Detroit Today, published in 1991; Michigan, published by Graphic Arts Center Publishing in 1993; China, published by The Child’s World in 1998; Fodor’s American Compass Guide, Michigan, in 2001 & 2005; Pure Michigan, published in China in 2007; Chine L’Eveil du Geant (China The Awakening Giant) for the French publisher Editions Bower in 2007; A Great Tourist Attraction, Scenic China, Coloring My World, Growing Up (2015) A Global Portrait, Ren Min Portraits in China (2016) and Painting with a Camera (2017) all published by Photo Explorer Productions. Dennis is a member of the American Society of Picture Professionals (ASPP) and Society of American Travel Writers (SATW). SATW’s Travel Photographer of the Year for 1997, Dennis was also runner-up for that honor in 1998, 1999 and 2006, as well as placing third in 1996. In 1984 his portfolio on China in the Minolta Mirror won an “Award of Excellence” from Communication Arts. Dennis has also been a photography workshop instructor for the American Photo Mentor Series, taught photography at Henry Ford Community College, and has written for several photography magazines both nationally and internationally. Darkroom Photography and the 1988 Photographer’s Market have profiled his work and he is listed in American Photographers, an “illustrated who’s who among contemporary Americans”. He has been the owner of Photo Explorer Tours since 1981.